The first book was pretty short and left me curious about Jack Templar. I was really glad that this story was longer and gave more of an in depth look at the Black Guard and what it really means to be a Monster Hunter. Jack hasn't completely accepted everything about his new life, but he is still amazingly brave and tries to defend those who may not be able to defend themselves. I admire the fact that Jack's friends have found their place at the Monster Academy as well, although it does create some tension between Jack and Will. We're introduced to a new character, Daniel, who seems to want nothing more than to make Jack's life miserable just for bearing the Templar name and expectations. Although Jack has just started at the Monster Academy, he manages to get into all sorts of chaos, and the danger that is Ren Lucre has a huge impact on his life there as well. Although this novel isn't non-stop action, it moves along at a nice pace building up to and ending that is jam-packed with danger and adventure. I definitely recommend this novel if you like monsters, mythology, and kids who fight evil. 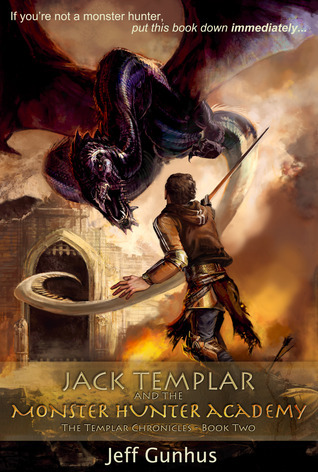 Make sure to pick up Jack Templar, Monster Hunter first and give that a read before tackling this one.